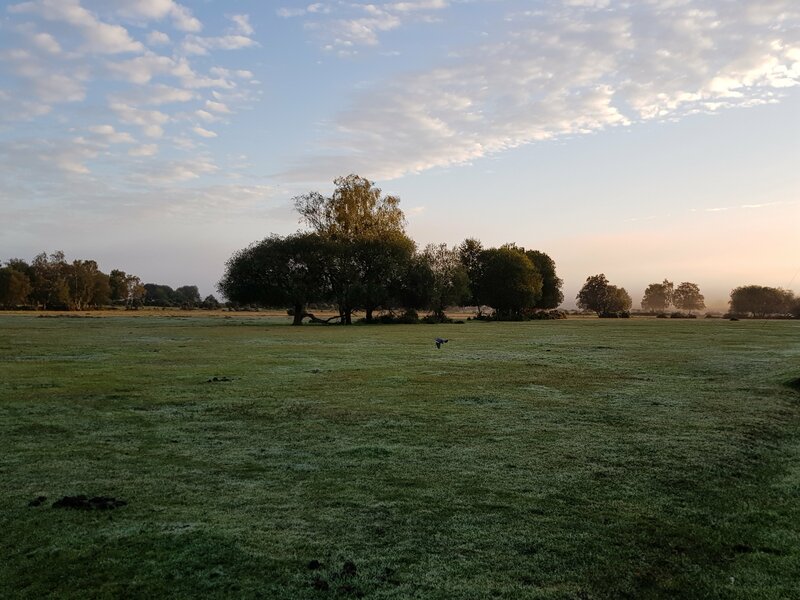 We decided to camp for the New Forest Marathon, not because it’s particularly far away, but because I had to get up early to fit in the extra miles, and well camping is fun. The weather was pretty shocking the night before with thunderstorms and heavy rain, sleep was evasive at best. We’d later hear that people had been abandoning their soggy tents to sleep in cars, but heyho we survived it. I woke up with the sun and my favourite thing about camping, that ‘straight in to nature’ feel. It was crisp and early and I got dressed in my running kit as quietly as I could and hit the road. I had 6 miles to do before I’d get to the start and I made sure they were peaceful ones. The foggy mist over fields as the sun came up was just a beaut. A quick turnaround and rush to the start saw me get there with about 5 minutes to go, I’ve never been this close to missing a race start before. I bumped in to Tom (@burgessking1) almost instantly, and we ran the start together. I love meeting people from the running community as conversation flows, runners love to talk about running, and for the most part we’ve run out of people to talk to it about, apart from other runners. Tom said something along the lines of “I’ll try and stick with your pace if you don’t mind” and I really didn’t. It’s been a while since I’ve had company on a run and with 26.2 still to do it was so nice to have a friend. I told him the plan was to run 10 minute miles which coincidentally would get him a PB, this only spurred me on to run with him and see him across the line. 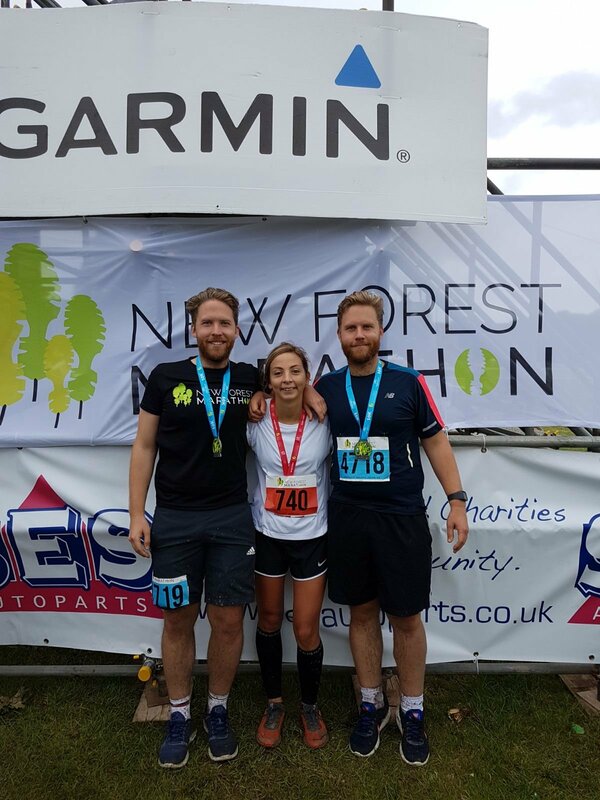 The New Forest Marathon is a total delight, the route is gorgeous and changeable, and I’d definitely class it as a trail marathon (although you do have a few road stretches). It had been wet, the mud and puddles were deep in places, and more rain would come. The forest is so diverse in landscape and it was most definitely undulating. I think we clocked up about 1500ft in the end, which is mad as the highest point of elevation can’t be over 200ft. It’s not an easy course, but like Iceland, there is something I definitely like about that. My pace was bang on, I slowed on the uphill, sped up on the downs, whilst levelling it all out on the flat. I didn’t walk, I didn’t stop, and I just kept those little legs moving forward. 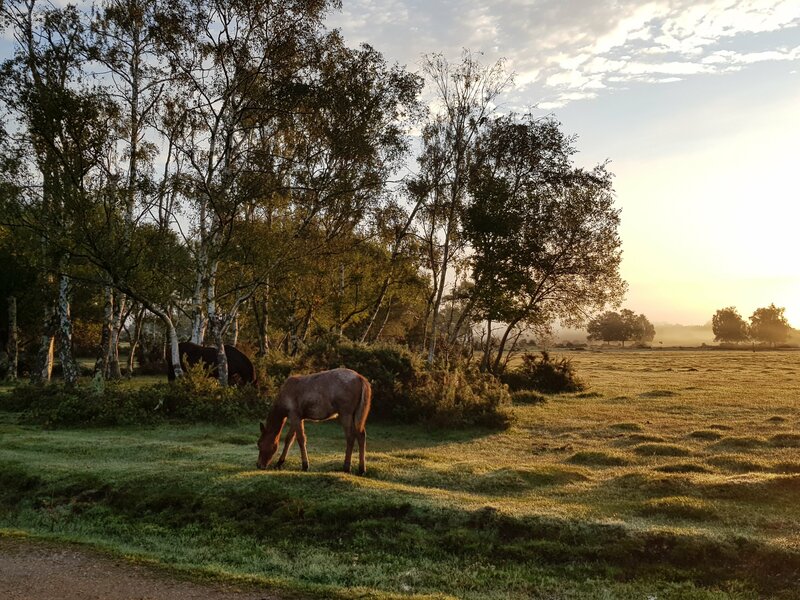 What does everyone think of when they think of the New Forest, Yep those wild horses! They were everywhere and running right across our paths. It was crazy to see, totally beautiful, and sometimes a little scary as I’m pretty sure if you were in their way they might just run right through you. We both agreed it felt like a movie set; gloomy sky over tall trees disappearing in to clouds. Whenever I got to the top of a hill I’d look back at the sea of coloured shirts amidst the grey and green and it was just beautiful. The marshals and organisation were top notch, we saw runners who were struggling getting medical attention super quickly, and the water stations were manned with the cheeriest (is that a word?) kids you ever did see; such a boost. On the road sections people clapped from their cars. In the forest sections the walkers, cyclist and locals cheered you round whenever you crossed paths. When you were on your own the nature was more than enough to keep your mind occupied, and I didn’t put my emergency playlist on once. I did have to take a toilet break which is something I’ve only ever had to do in one other marathon, but I had started that bit earlier and had been running for that bit longer. I held out for an actual toilet rather than the forest. Although if I hadn’t come across that toilet soon, nature’s loo would have had to do, and I saw quite a few runners taking this option. 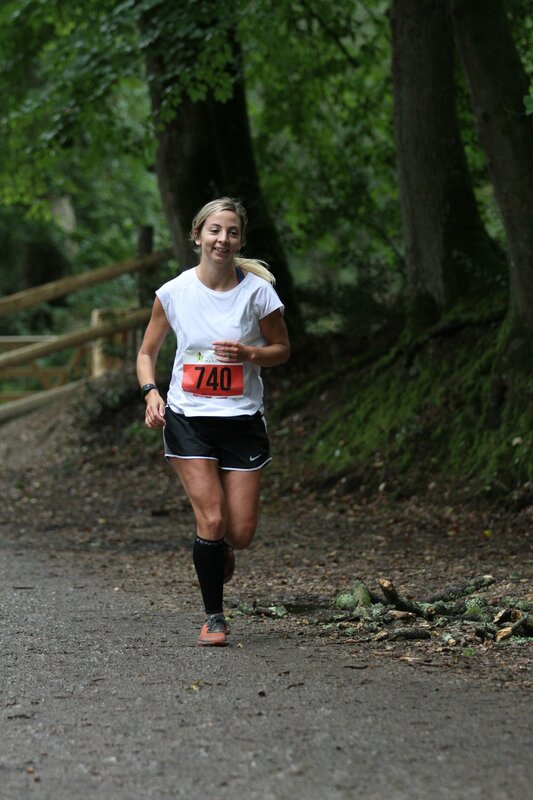 My legs felt mostly fresh which I was pleased with as my mileage had been so high recently, and I’d had 0 time to taper. As I clocked off 26.2 knowing I still had 6 to go mentally it was a little tough, but I still felt physically strong, and the fact we were well under 10 minute mile pace made it easier to brush it off and distract myself with something else. We honestly, well I honestly had a blast, and had this smile on for the whole run. Tom and I stuck together for the whole race in the end, minus a small stretch where I lost him. It couldn’t have been for much more than a mile and he found me again, and I was so happy he did. I wanted to finish with him and I wanted him to smash that PB. As we neared the finish I got a little emotional and Tom went live on Insta. He said he was going to sprint the finish and I thought I’d let him go. My legs were tired and I honestly thought I didn’t have it in me. Not a moment later my brain kicked in and said ‘screw that’ as I remembered the words I hear so often when I’m flagging in training “this is where the gains are made”. I ran as hard as I could, caught Tom and crossed the line just moments ahead in what has now been officially confirmed as 4:12:00. Tom taking a crazy 15minutes+ off his PB, I gave him a huge hug. I do LOVE a sprint off! I Can’t believe my sister captured this ace shot, which will keep me smiling for days! I can’t tell you how happy this race makes me, this time last year I struggled around a very flat Amsterdam in 4:17, and yet yesterday I took on an undulating mixed terrain marathon in 4:12 whilst having 6 miles already in my legs. I packed up all my good vibes and wandered over to the tent to meet the team from runr (go checkout their stuff if you haven’t already). They were the loveliest guys to chat to, and it was again another boost to the mega feels I have for this running community. Then I went and sat on a bus and drank a beer (a pub in a bus, genius! ), before the heavens opened and it was time to go home. I struggle so much with stopping and actually looking at my achievements. I find it a little cringe worthy. Being proud of myself just doesn’t come naturally and I prefer just brushing it over and looking on to the next big thing I want to do, or goal I want to reach. Today I’m going to say how insanely proud I am of the race I ran. Running 32 miles is something I have never done, and it’s all part of a master plan to get me to the finish line of the 38 (in 3 weeks) and the 50(in 6 months) and maybe even one day the 100. All these steps are progress, and that progress has come from me. It comes from the mental and physical toughness I’ve worked to build day in day out. That strength that I’ve built is incredible, and I am so proud of it, and of me, and my body, and what together (mind&body) we are achieving. My official time for the 32 was 5:16:16, although moving time on Strava shows 5:11:42, as I think I was a little late on stopping my watch and the toilet stop of course. But honestly who cares?! I’ve never done it before so it’s an automatic PB. 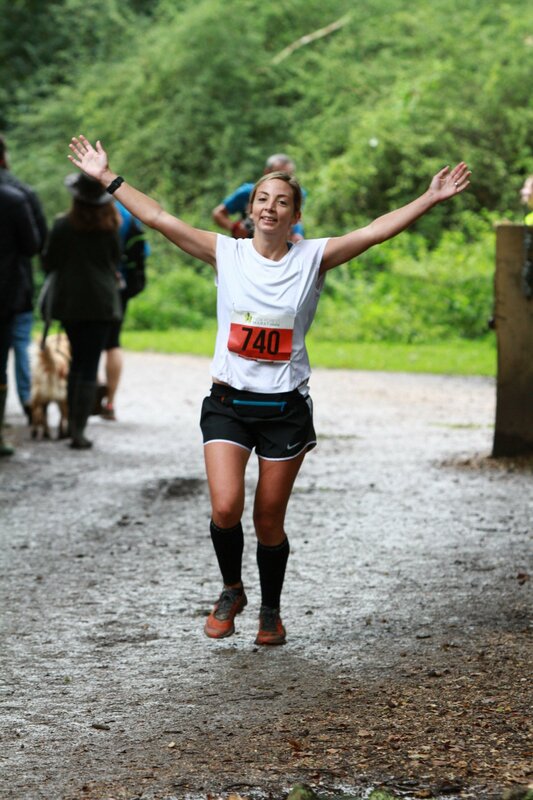 The biggest takeaway for me is that I felt great doing it, and that usually comes when I run for the love of running and not for the time chasing. Well done to my family who came and ran and cycled and camped. Following me around isn’t easy and I appreciate it more than you could ever know! Whatever thing you say to yourself “that is crazy, i could never do that”, yeah that thing! Start putting in the plans, the stepping stones to get you to that place. Because the thing you never believe, and the thing I’m only just starting to believe, is that you can truly do anything, as long as you want it. Yesterday was world suicide prevention day and I ran every single one of those 32 miles feeling so much Love for the people we have lost, and for the ones like me that tried and failed, as that failure will always be my biggest success; and the catalyst that started this whole thing. Although it took many years to get here, I’ve never felt more like I belong. Donation going to IASP and it couldn’t go anywhere else. If you don’t want to donate, then can I compel you to check in with the people around you, and make them a cup of tea, and ask them if they are ok really. If you are not ok really can I compel you to reach out to your friend, and say the simplest yet hardest words to say ‘I am not ok’. What happens next might surprise you. Love your people as hard as you can and live your life with adventures, if you can do that most of the time then everything else just has to be all right, eventually. 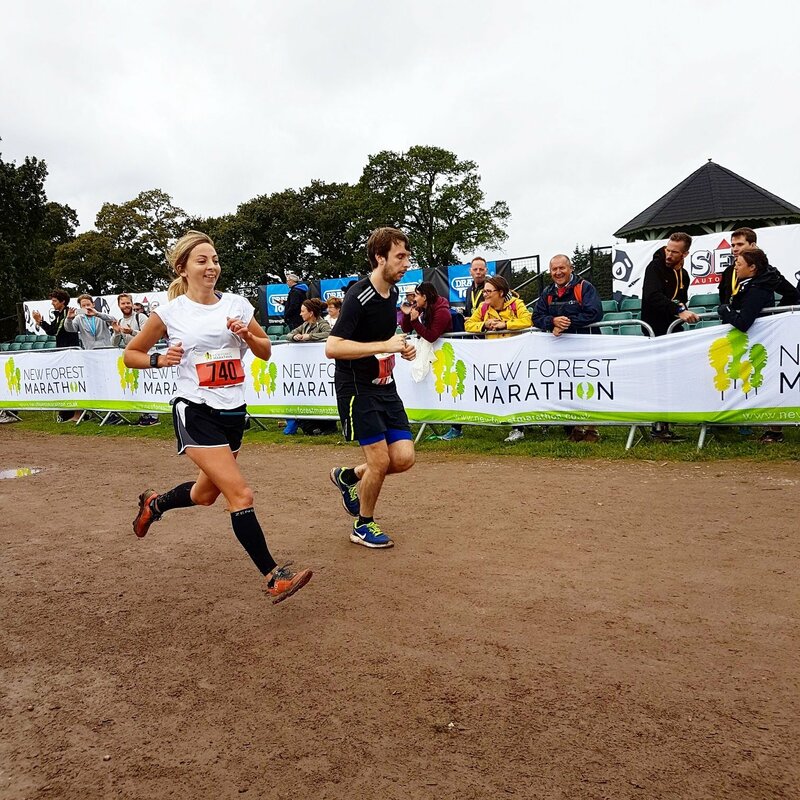 Brilliant work – 32 miles!! This looks like a lovely marathon, it’s making me regret my ‘no marathons in 2018’ policy already…. !